Home › termites › What Is the Most Common Type of Termite in Virginia? There are three basic types of termites, and there are different steps that you can take to protect your home from those types of termites. It helps to know what the primary types of termites that you will need to worry about in and around your property. In Virginia, the most common type of termite is the Eastern Subterranean termite. The Eastern Subterranean termite is spread throughout the Eastern part of the United States. These termites live underground in colonies and the termites will crawl up into the wood to feed. They will build mud tubes to protect themselves as they crawl up into your home. There three different roles in an Eastern Subterranean termite colony. The workers will focus on getting the wood to feed the colonies, the soldiers will protect the other termites, and the queen and kings. These termite colonies can move as they move from food source to food source. The best way to prevent these termites from infesting your home is to remove everything that attracts them to your yard. This means clearing out old wood like fallen trees or branches. You may also want to clear out old tree stumps. Clearing out leaf debris can also help. Be sure that you do not use wood mulch near your home, since the termites will eat that. You should also be sure that you only use treated wood in the building projects around your home. You should also be sure that your home is in good repair. Leaks can make your wood wet, which is how termite prefer it. You should be sure that the wood dries out completely. Check your foundation periodically for cracks, which can give termites easy access to your home. You should also check for mud tubes along the foundation, which is a sign that you already have termites in the home. What Other Types of Termites Can Damage My Home? 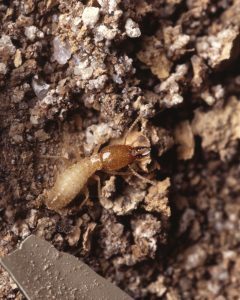 There are two other subtypes of termites. Dampwood termites like to feed on damp wood. They may come in through your attic. These termites need constant access to moisture and they can actually build their colonies inside of the wood of your home as they eat it. Drywood termites will also live inside the wood of the home. They are more likely to eat through the siding of your home and you can even find them in furniture. Keeping your home in good repair can prevent the termites from finding their way into your home.